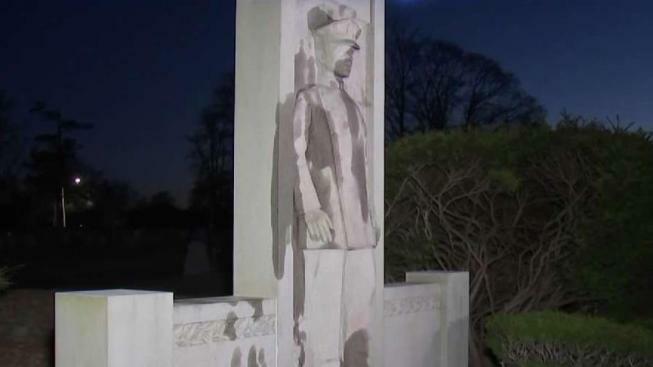 Police are investigating vandalism of monuments at a cemetery in Boston's Mattapan neighborhood. Police are investigating after memorials at a cemetery in Boston's Mattapan neighborhood were vandalized. Boston Police said Tuesday that officers responded after the vandalism of several monuments was reported at Mt. Hope Cemetery. Among the vandalized monuments was the Boston Police Relief Association Memorial, dedicated to fallen officers with the department. "How incredibly distasteful and disheartening it is to learn about the damage done to the memorials at the Mt. Hope Cemetery in Mattapan. Clearly these memorials are meant to honor and show great respect to those, whether they be veterans or police officers, who spent a lifetime in dedicated service to our city and nation," Boston Police Commissioner William Gross said in a statement. "I find it beyond reprehensible and wrong that anyone would think it okay to damage and desecrate such hallowed grounds. Clearly, we hope to quickly identify and hold accountable the person responsible for these misguided and hateful actions." Over the weekend, a World War II memorial was vandalized in South Boston. Police did not say if any connection was suspected. Anyone with information is asked to call 617-343-4712. Anonymous tips can be left by calling 1-800-494-TIPS or by texting "TIP" to 27463.